Here’s why I love hellebores: they’re evergreen, tough, long-lived, shade-loving, deer and rabbit resistant, and quietly beautiful year-round. Add to that – they start flowering in the dead of winter when our gardens are mostly sleeping. Hellebores can serve as ground cover, but they’re so much more. Group them in shady locations under trees or large shrubs, in woodland gardens, or at border fronts. Or you can incorporate them into a naturalized area where the clumps will slowly spread through self-seeding. They’re at the top of my list of favorite lowmaintenance perennials. The official name is Helleborus, of the buttercup family, Ranunculaceae, known for cup-shaped flowers. Once established they just do their thing without any fuss. Getting established may take a year, but during that time they look great and are an immediate evergreen addition to your yard. Most of my hellebores are Lenten rose or H. orientalis. They bloom late winter to early spring in shades ranging from white to plum, rose, pink, or magenta, some with contrasting spots inside each blossom. And they bloom for weeks. The flowers stay put for as long as eight to ten weeks, but, though still pretty, their colors fade. The leaves are about ten inches across with seven or more leaflets that are dark green and leathery with toothed edges. I also have several H. foetidus, or stinking hellebore, also called bear’s foot hellebore. They are tall and upright with small, lime green, cup-shaped flowers. The bright green leaves have lots of very narrow leaflets, very different from H. orientalis. They also bloom from mid-winter to spring. It’s a beautiful hellebore and only smells bad if parts are crushed or bruised. Maintenance on hellebores is easy. They have very few problems; deer and rabbit don’t eat them, maybe because all parts are poisonous. But watch for slugs and snails. You may need gloves because the stems and leaves are a bit spiney, and touching them may irritate your skin. Planting and care are about the same for most hellebores. Plant them in shade with lots of organic matter, making sure they have good drainage, and they will serve you for many years. Fertilize with general landscape fertilizer when you see the first new green leaves, probably in November, then again in February when you see the flowers starting. In early spring, peek under the newer leaves and look for the older leaves that look a bit winter worn. Cut those off, being careful not to nip the new growth. Hellebores can be divided but really don’t need to be. And they don’t like to be dug up and moved – so don’t make work for yourself. I don’t remove old blooms; they’re still pretty even when they lose their color. The seeds drop and make dozens of tiny seedlings. They won’t all live, but leave them where they are until the second year, and then dig up a bunch with a lot of soil and move it to another shady spot. The seedlings probably won’t come true to the parent, but that’s OK with me. It’s fun to see what you’ll get! Gardening is, after all, a lot about anticipation. If you don’t want any seedlings, just remove old blooms. My hellebores have come over the years from friends’ yards, plant sales, plant swaps, garden centers, and as gifts. The blossoms are all of the “nodding” variety, meaning they face the ground. I plan to check out a few of those new cultivars, such as ‘Ivory Prince’, ‘Red Lady’, and ‘Pink Frost’, whose blossoms face upward! ‘Ivory Prince’ blooms white, then in a few weeks turns bright lime green. ‘Red Lady’ is tall and bushy with deep maroon flowers. ‘Pink Frost’ has burgundy stems, silver-frosted leaves, and flowers of white, pink, and deep rose. 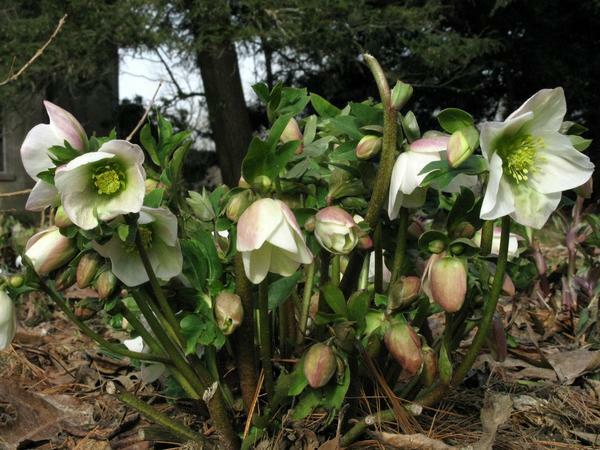 What I want you to take away from this is that I hope you’ll plant some hellebores; they’re beautiful, rewarding, easy care, and add year-round beauty to the shady areas in your gardens. And be sure to look for the new ones whose blossoms face the sky! Posted in evergreen, Flowers, Home Landscape, Perennial, Plant Profile. This entry was tagged deer resistant plants, Hellebores, poisonous plants, rabbit resistant. Bookmark the permalink.